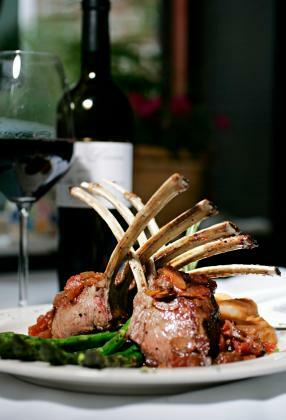 Many people become intimidated when they consider how to cook a rack of lamb. This meat has a showy appearance and makes a beautiful main dish for a gourmet meal, but it doesn't have to be difficult. Anyone can learn to cook a rack of lamb. Rack of lamb at its best is juicy and tender with a delicious, meaty flavor. Cook it to medium rare, leaving the interior meat pink and juicy for the best flavor. The ideal temperature is about 125 to 130 degrees when cooked. A rack of lamb comes from the lower ribs on a lamb. You can purchase rack of lamb with the fat and meat still covering the first few inches of rib bones along the top of the rack, or with the bones cleaned off. When the bones are cleaned, it is known as a Frenched rack of lamb. If you don't purchase the rack Frenched, you will need to French them yourself to provide the rack with a clean appearance and promote even cooking. Roasting is the ideal way to cook a rack of lamb. You can break the process down further into three distinct parts: preparation, roasting and resting. Score the fat covering the meat using a crisscross pattern across the surface of the lamb. Season both sides of the rack with salt and pepper. Rub the lamb with single herbs, mixtures or herb paste. Allow to sit at room temperature for 30 minutes before cooking. Press the crust over the scored fat and roast. Cooking lamb at high heat preserves the tender and juicy nature of the meat. The best roasting temperatures are between 425 and 450 degrees Fahrenheit, allowing the lamb to cook to medium rare in about 12 to 18 minutes. If you'd like a sear on the outside of the lamb before roasting, preheat a sauté pan with olive oil until the oil shimmers. Season the lamb with salt and pepper, and sear the meaty side for 3 to 4 minutes until it develops a golden brown color. If you elect to pan sear before roasting, add herbs, crust or herb paste after searing and before roasting. Once the lamb has cooked, allow it to sit on a cutting board at room temperature for about 20 minutes, tented with foil. This allows the juices to redistribute through the lamb. Don't skip this step, or you risk dry lamb. After the lamb has rested, slice individual chops in between the bones. Serve the lamb with sides such as saffron rice and asparagus and pair with an earthy Pinot Noir wine from Oregon, California or the Burgundy region of France. With a little bit of know-how, learning how to cook a rack of lamb doesn't need to be difficult. Why not try it the next time you need a special meal?